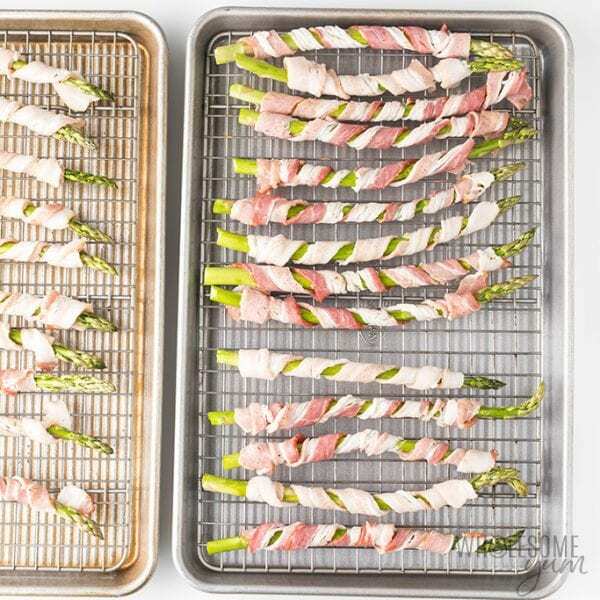 This easy bacon wrapped asparagus recipe in the oven includes tricks for extra crispy bacon. Everyone loves these easy asparagus and bacon appetizers. Ready in 30 minutes! I’ve been making this baked bacon wrapped asparagus recipe (and occasionally prosciutto wrapped asparagus) for years, and it occurred to me that I have yet to put it on the blog. It was about time to change that. You can always use more asparagus and bacon appetizers, right? With other bacon asparagus recipes, I’ve noticed that often times the asparagus is soft before the bacon has had the chance to crisp up. Yuck, who wants soggy bacon? I was on a mission to avoid this. I’m pleased to report that I found a way! And ever since then, this has been one of my favorite asparagus and bacon recipes. 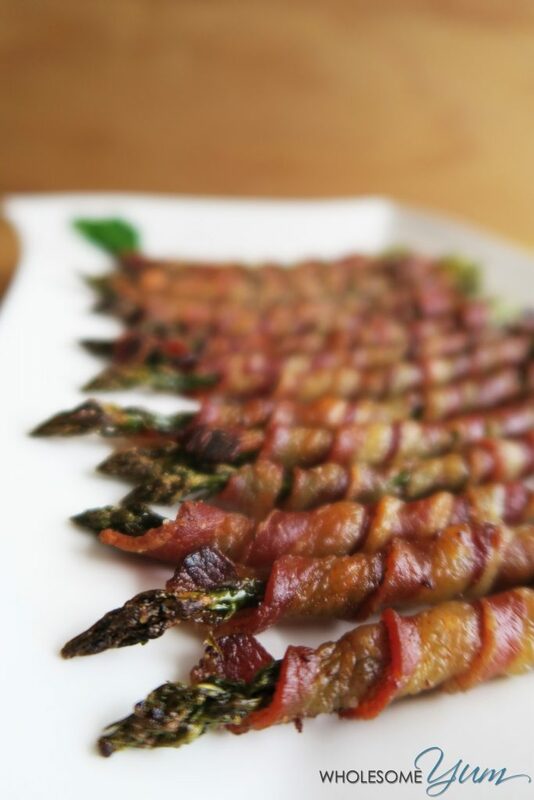 In fact, this bacon wrapped asparagus in the oven pretty much tops my list when it comes to paleo asparagus appetizers… and bacon appetizers, too. Even if you’re not a huge fan of asparagus, give it a try. It’s a good sign when you hear comments along the lines of, “I don’t usually like asparagus but this is really good!” Seriously, asparagus with bacon is so much better than it is plain. The key to getting the bacon extra crispy is to allow for more air flow around the bacon, which I accomplished by making four adjustments. They were actually incredibly easy and made a big difference in the result. Then, wrap them in a pinstripe pattern around the asparagus. You want the edges of the bacon strip to overlap as little as possible. This will help create more air flow around it, which is what you want for extra crispiness. Instead of a regular baking sheet, use a wire rack on top of a cookie sheet. (I like this one – it’s non-stick, so easy to clean.) It’s such an easy swap to make, and again it helps with that whole air flow thing. As a bonus, this lets some of the extra fat drip down from the bacon during baking. Not that there’s anything wrong with bacon fat, but doing this actually helps the bacon get more crispy. 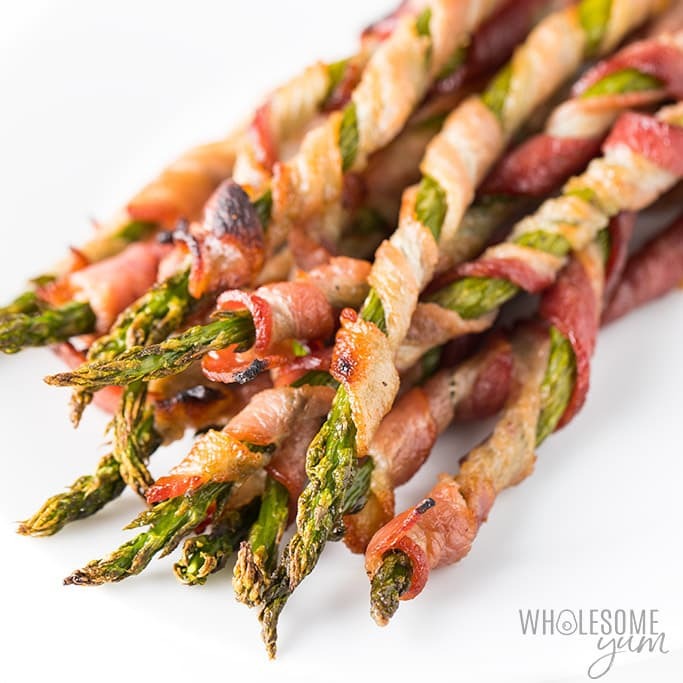 Making this yummy asparagus and bacon appetizer just a little lighter is just icing on the cake. You can always re-purpose the bacon grease for something else if you like. 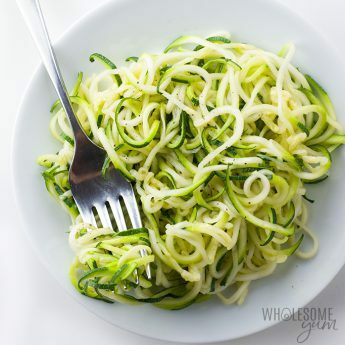 I always do – it’s delicious to use for frying things later! Flip the asparagus halfway through baking. This will encourage more even cooking, so that all sides get evenly crispy and don’t burn. Sure, it’s an extra step, but it only takes a second. 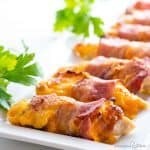 If you’re making bacon appetizers, it’s totally worth it to do what it takes to make them crispy! At the end, place the baking sheet under the broiler for a couple of minutes to get the bacon extra crisp. You’ll want to watch it closely, because it can go from golden to burned very quickly! Just don’t skip this step, because it’s the key to making bacon wrapped asparagus in the oven super crispy. There you have it. The end result is crispy bacon appetizers with a beautiful presentation, thanks to the “pinstriped” pattern. How Long Do I Cook Bacon Wrapped Asparagus? Type of pan used – are you using a wire rack or not? On average, it takes about 18 to 22 minutes at 400 degrees F, and then I recommend another couple minutes under the broiler to crisp up the bacon. Can You Make Bacon Wrapped Asparagus Ahead? You can prepare these appetizers a day in advance, cover, and refrigerate until you’re ready to pop them in the oven. I do this all the time when we’re hosting! However, I don’t recommend actually baking them in advance. Both the bacon and asparagus will get soggy. 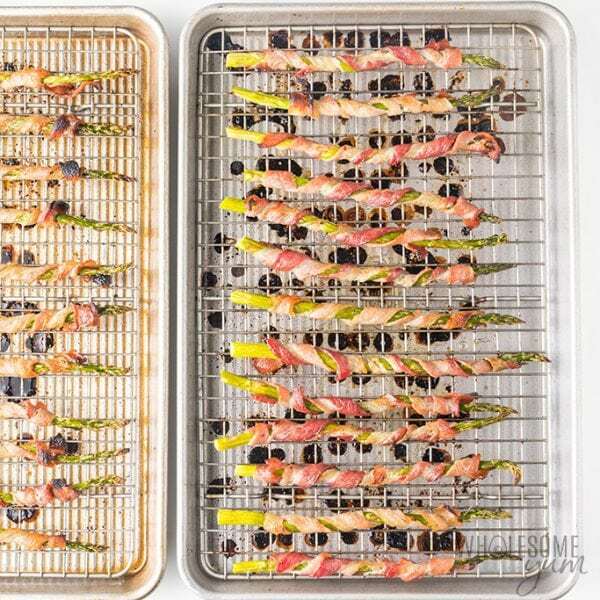 If you’re making this bacon wrapped asparagus recipe for an event and it just cools down as it sits, you can return it to the oven under the broiler for a few minutes to get more crisp and reheat. This baked bacon wrapped asparagus is my favorite way to make asparagus in the oven. It makes a wonderful side dish, or you could cut the asparagus in half to make shorter appetizers. Personally, I love to make bacon wrapped asparagus in the oven, all year round. Everyone is thrilled to see it on the table for holidays and birthdays during the fall and winter months. Then, of course you’ve got the spring and early summer time when asparagus season is in full swing. This is one of the few reasons I’m willing to turn my oven on in the summertime! It’s a win-win, no matter the time of year. 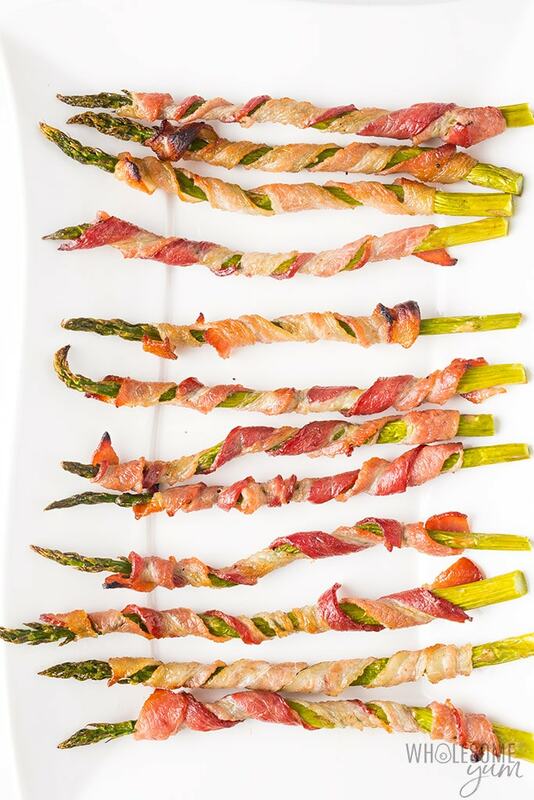 You can’t go wrong with an asparagus bacon recipe. I like to think I’ve come a long way with my photos, but even back then, it looked impressive and was super easy. Are you ready to make some? I’m so glad so many of you are making this bacon wrapped asparagus recipe! Cookie sheet with wire rack set – This one is non-stick, PTFE/PFOA-free and oven-safe. A must-have for making bacon wrapped asparagus! You can also get a larger one like this for making a double-batch. This easy bacon wrapped asparagus recipe is baked in the oven, with some tricks for extra crispy bacon. Everyone loves these easy asparagus and bacon appetizers. 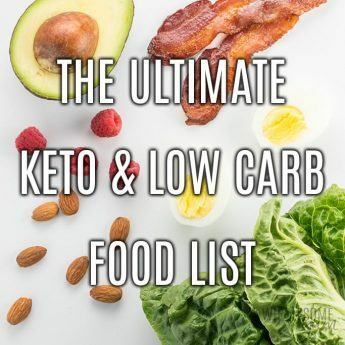 They're naturally paleo and low carb, too. Ready in just 30 minutes! Cut the bacon slices lengthwise to make narrower strips. 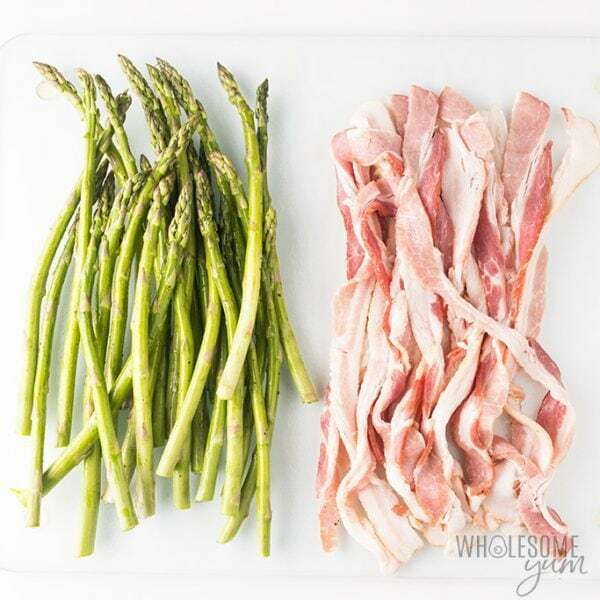 Wrap each bacon strip tightly around an asparagus stalk, only slightly overlapping the bacon on each stalk (it will shrink during cooking, creating a "striped" pattern). Place seam side down onto the wire rack. Bake for 10 minutes. Use tongs to turn over. Bake for 10-15 minutes more, until the bacon is almost crispy. Set the oven to broil, then place under the broiler for 1-2 minutes to crisp up more. Click or tap on the image below to play the video. It's the easiest way to learn how to make Bacon Wrapped Asparagus! Hi Nancy, Yes, you definitely can but I haven’t done official testing to give an exact time for the air fryer. I’m so glad to hear that, Alysha! If the oven is smoking, it’s likely that there are food bits burning on the heating element or somewhere else in the oven (not the pan itself), so a thorough cleaning should take care of it. Can you use frozen asparagus? Hi Alicia, Yes, you can, but the texture is better fresh. The baking time would be a bit longer for frozen asparagus. 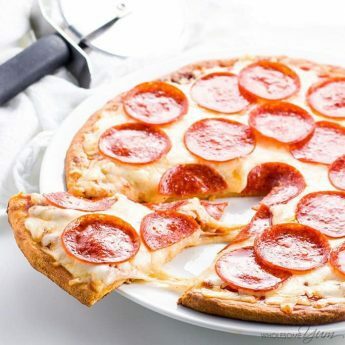 THANKS SO MUCH FOR YHUS DELICIOUS QUICK RECIPE!!! 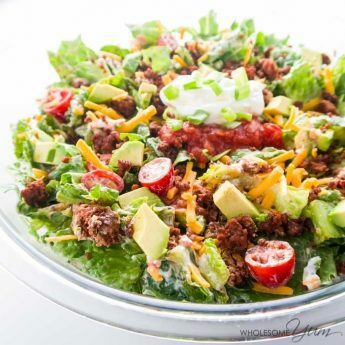 My grandkids asked me to make it EVERYDAY… it was that GOOD!!!! btw it’s EASY PEASY!!!! 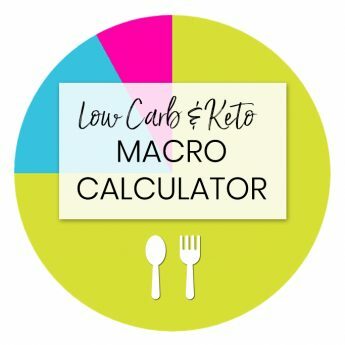 Can’t wait to try more of your recipes & the video & hints EXTRA HELPFUL! Again thanks!!! Love bacon wrapped asparagus! 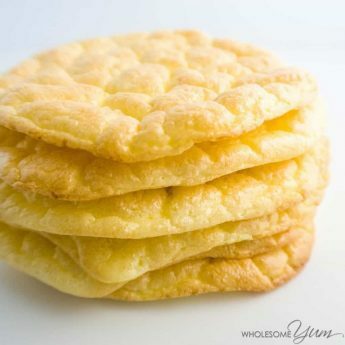 I usually make them in the frying pan, will try the oven next. I’ve had this before and it’s SO good!!! Can’t wait to make it again. 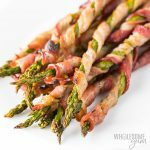 I love bacon and asparagus and I loved it when I tried it so I am definitely going to add these to my recipe list! I’m super glad for all your experience and tips so I don’t have to flub it up the first time I make these. So yummy and fun! My favorite foods together! Excited to have this recipe again! These is so simple but so tasty – perfect for entertaining! Made these last night. Great flavour, easy to make. What more could I want? You had me at bacon! Yum, this is fab! So little effort for so much reward! Wrapping veggies in bacon: brilliant. 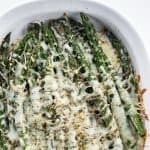 I’m so happy it’s finally asparagus season so I can make this!! What’s not to love when it includes bacon AND vegetables. This is the perfect party platter! I love bacon wrapped asparagus and this recipe comes out so perfectly cooked! 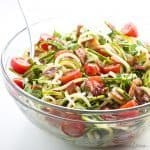 One of the best spring paleo appetizers for sure! Good tips, too!